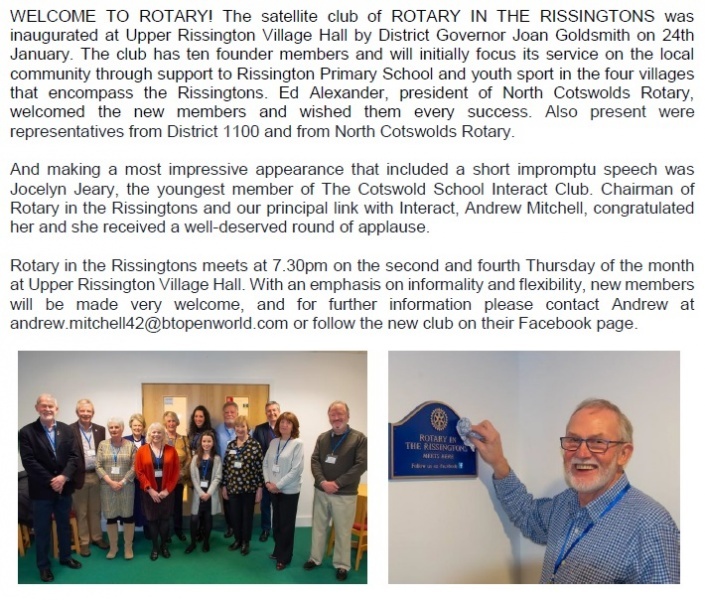 North Cotswolds Rotary - Welcome! Our Club was founded on April 6 1965 with 28 members and its first meeting was held on April 23 the same year. 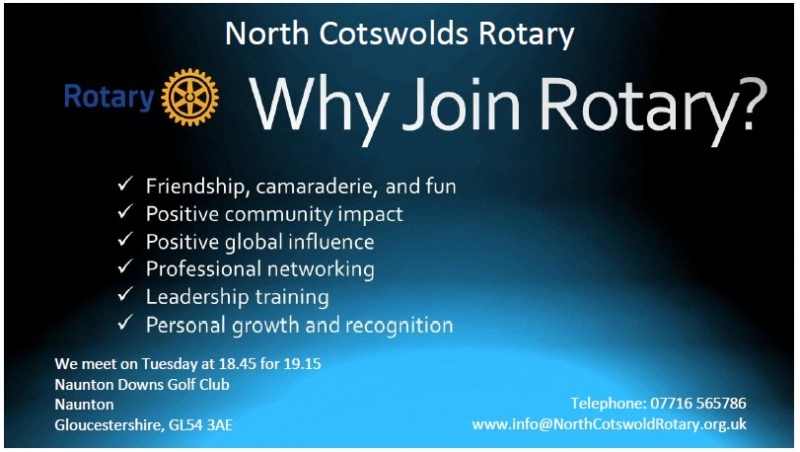 Today we have over 40 members and meet every Tuesday evening (6.45pm for 7.15pm) at Naunton Downs Golf Club - (on the B4068 just outside Naunton village) - Post Code GL54 3AE. 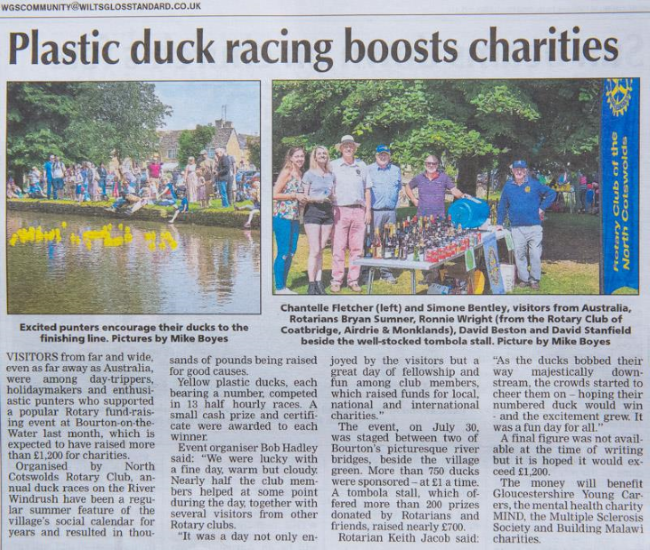 The club's annual charity duck racing event took place in Bourton-on-the-Water on Saturday 28th July. After months of dry hot weather, forecasts of torrential downpours and thunder storms seemed to have kept visitor numbers down, but those who came enjoyed a fun day at the races! 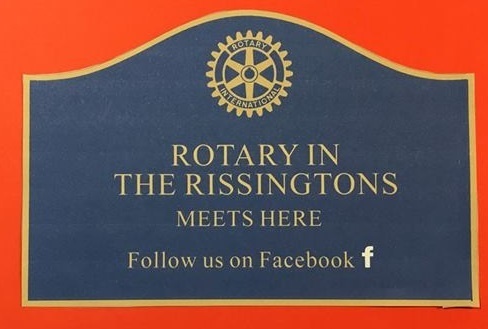 We welcomed several Rotarians from other clubs who lent a hand - Ronnie Wright from Coatbridge, Airdrie and Monklands, and Michael Menges from the Rotary Club of Giessen in Germany. We raised just over £900 for the club's chosen charities this year - Kate's Home Nursing, Great Western Air Ambulance, and Canine Partners. Our thanks to Bob Hadley for organising the event, and to Sue Hadley and Janet Prout for attending all day to sell tickets for all the races which took place between 10am and 4pm. 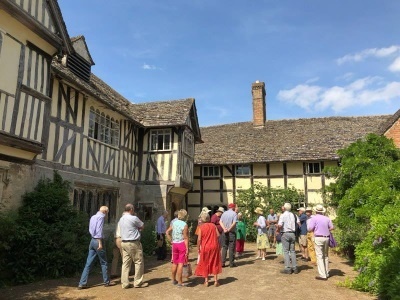 Club members and friends had a most enjoyable social outing to Frampton Manor and Frampton Court, Gloucestershire, in glorious weather on 25th July. 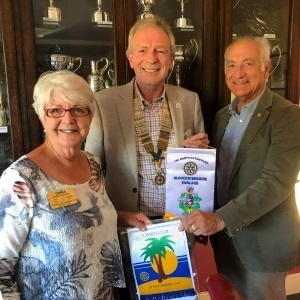 On 10th July the club welcomed Diana and Roger White of the Rotary E-Club of the Caribbean, to our weekly meeting. Diana, who was Governor 2010-2011, District 7020. On 3rd July we were pleased to welcome Deborah Mattsson, President of Malmo International Rotary Club, as our guest speaker. 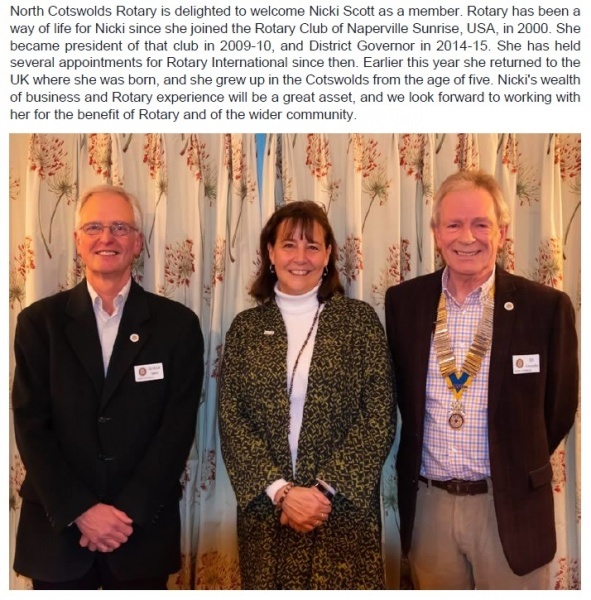 Deborah, whose parents live in Bourton-on-the-Water, gave a very interesting talk on Rotary activity in Sweden and the help her club gives to the local community. 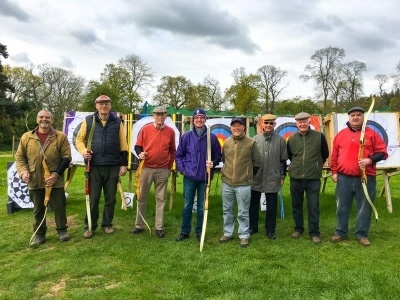 Club members enjoyed a social outing to Batsford Arboretum for two hours of archery, using a variety of different styles and strengths of bows. A lot of fun was had by all, and by the end of the session we had learnt a bit about the history of archery and our skills had shown modest improvement. 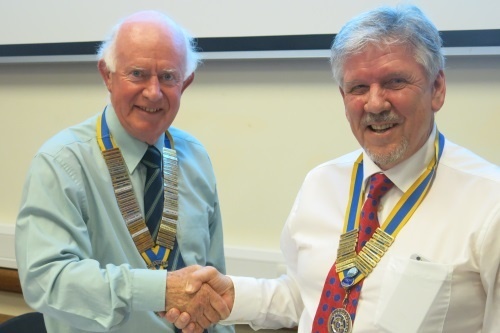 Club members and partners were present when Peter Boxall handed over the presidency of the club to Ed Alexander. 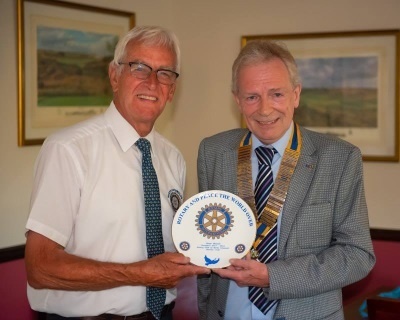 In turn, Ed thanked Peter for all he had done to ensure the success of the Club during his year of office and presented him with a Commemorative Rotary Plate. 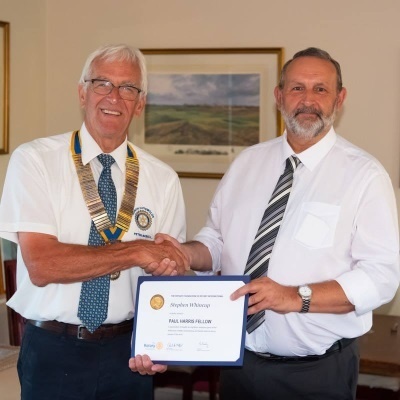 President Peter presented Steve Whincup with a Paul Harris Fellowship and thanked him for his many years of excellent service as Club Secretary. 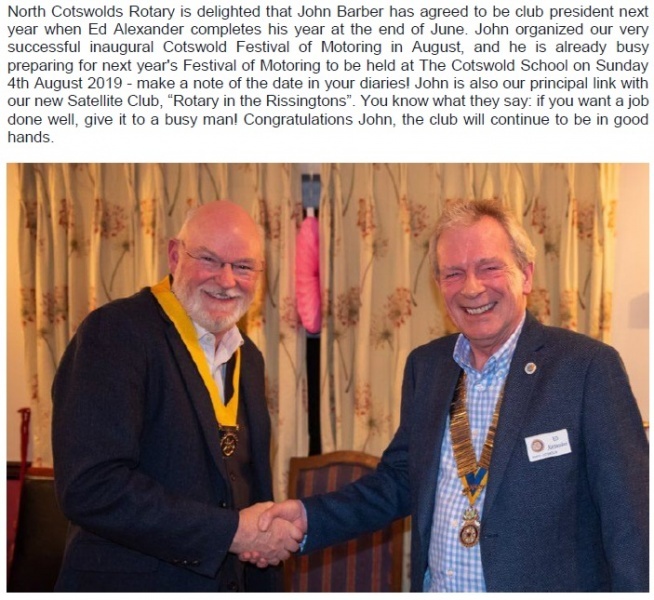 Congratulations to Keith Jacob on receipt of a very well-deserved Paul Harris Fellowship award for his outstanding efforts on behalf of North Cotswolds Rotary Club. The award was presented to Keith by club president Peter Boxall. The Charles Appleyard Award for outstanding service during the year was presented to Ed Alexander, (our incoming president for 2018-2019). 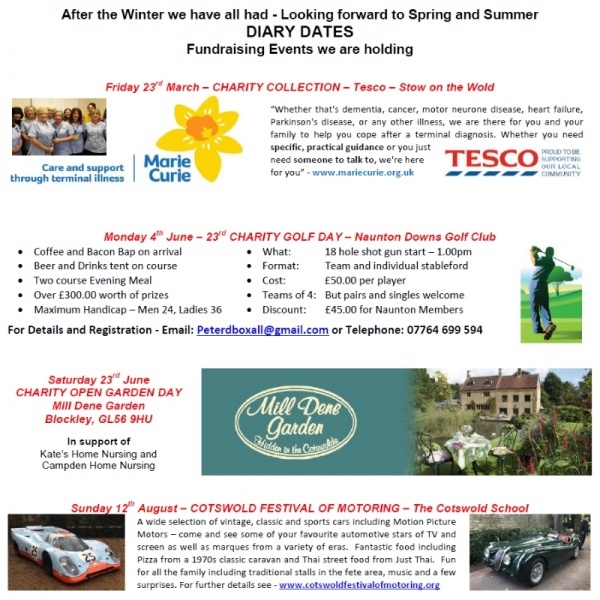 On Saturday 23rd June North Cotswolds Rotary Club, together with Chipping Campden Rotary Club, supported a fundraising Open Day at Mill Dene Gardens in aid of Kate's Home Nursing and Campden Home Nursing. A total of £700.00 was raised, to be shared by the two charities. 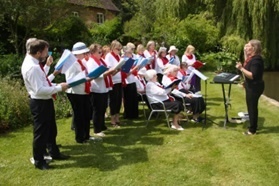 Visitors were treated to musical entertainment by Bourton U3A Recorder Group, and also by the U3A Capella Choir. Our grateful thanks to Mrs Wendy Dare for giving us the use of her beautiful house and gardens for a most enjoyable and successful day. 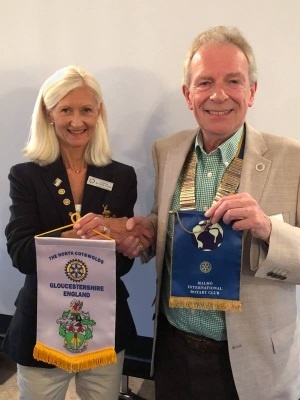 On 12th June club members heard from Stella Barnes about her continuing work with her charity 'Street Children of Cambodia', one of the club's chosen charities for the current year. Stella transformed a rubbish-filled hole in the ground into a Theatre for Children to stage shows. Her latest project enables glasses to be adjusted separately to suit the individual user. 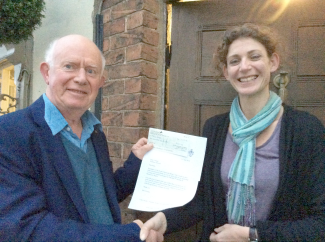 Peter Boxall presented Stella's charity with a cheque for £500.00, and we wish her success with all that she does to transform the lives of the street children of Cambodia. On a dull afternoon on Monday 4th June 62 golfers gathered at Naunton Downs Golf Club, situated high up in the beautiful Cotswolds, to play 18 holes of golf in aid of charity. It may have been a grey day but, as always, golfers chose to wear a bright array of colours to bring a sense of fun to this, the 23rd Annual Golf Day organised by North Cotswolds Rotary Club. 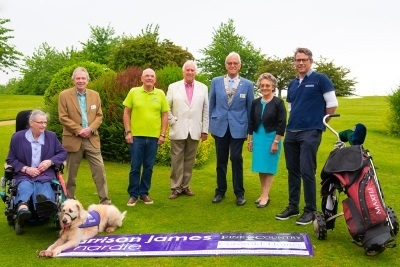 “The success of this event depends not only on our golfers,” said club president Peter Boxall, “but also on the generosity of our sponsors and in particular our main sponsor, Harrison James and Hardie. 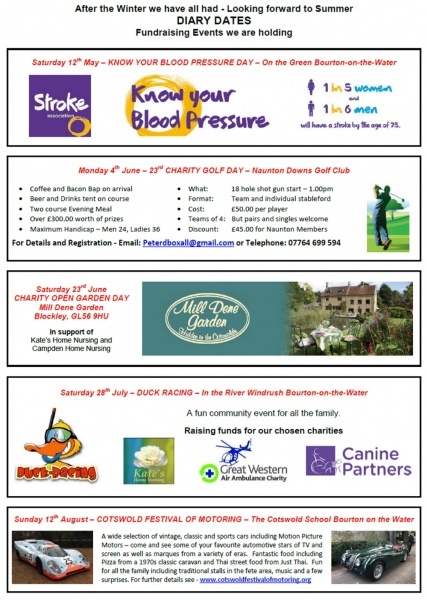 Without their support we would not be able to raise funds for our three very worthy charities – Kate’s Home Nursing, Great Western Air Ambulance, and Canine Partners who train assistance dogs for people with physical disabilities.” Peter also thanked Ian Wilson, owner of Naunton Downs Golf Club, for allowing Rotary to hold the event on such a lovely course and for providing such a good service on the day. The tournament, an 18-hole Stableford competition for both team and individual prizes, began with a shotgun start at 1pm, and the last players finished at around 6pm. The individual winner was Mark Salf with a score of 40 on count back, who took home the Honess Cup and a pair of golf shoes, and the runner up, also with a score of 40, was Peter Campbell. Else Ogden won the Ladies Bowl with a score of 36, and the Clifford & Webb Cup for the best Rotarian score was won by Colin Gatenby with a score of 29. The team prize was won by Charlie Davies, Charles Hanks, Mathew Hutchins and Will Spiers with a score of 97, and Alex Doggett won the Longest Drive with a massive distance of over 300 yards. 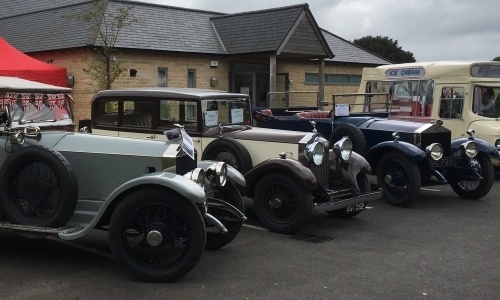 As no player managed a hole in one, the prize of dinner, bed and breakfast for two donated by the Lords of the Manor Hotel in Upper Slaughter was auctioned for charity, fetching a further £240 – very good value for the winning bidder. Before an excellent dinner prepared by Teri Collett and her team, Peter Boxall presented cheques to representatives of the three beneficiary charities. 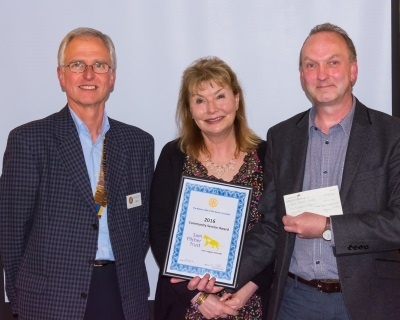 On behalf of Kate’s Home Nursing Mike Pender thanked North Cotswolds Rotary Club and told the assembled audience that Kate’s needed to raise around £370,000 every year just to pay for the 22 nurses they employ to look after people in their final days. 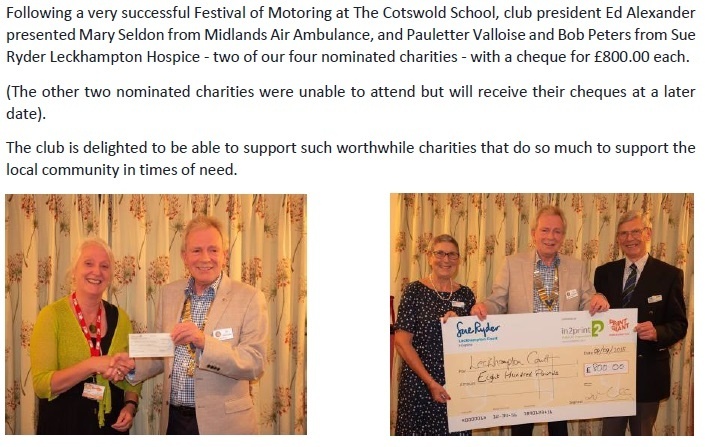 Kate’s is very much a local charity, covering the Cotswolds from Northleach, Burford, Bourton, Stow and Moreton, and over to Winchcombe. Steve Mould, on behalf of Great Western Air Ambulance which covers six counties –Bristol, Bath and NE Somerset, N. Somerset, South Gloucestershire, Gloucestershire, and Wiltshire, with a total population of 2.1m – said that in 2017 they flew 1824 missions, an average of 5 a day. They can reach anywhere in their region within 20 minutes, and their work means that one in five critically injured patients otherwise expected to die, survive. They receive no funds whatsoever from government or the National Lottery as, bizarrely, they are deemed to be part of the Health Service, and so they rely solely on fundraising and public donations to meet their annual running costs of almost £3m. 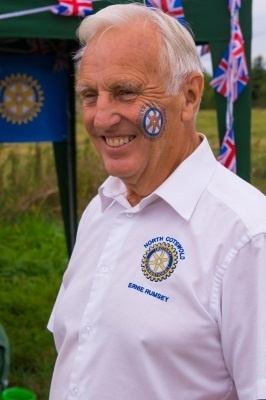 Events like this golf day are a vital source of income, and Steve thanked Rotary for their generous donation. Colette Kilmister, with her assistance dog Jennie by her side, represented Canine Partners, a charity that also receives no government funding. “A trained Assistance dog is better than a carer,” explained Colette, “as they are there whenever you need them and will do anything you ask them, just for a piece of cheese.” The cost of a puppy is around £2000, and the life cost of an assistance dog from puppy to retirement is about £20,000. A suitable dog spends about a year with a ‘puppy parent’ and then undergoes advanced training for a further six months. Colette said that her dog Jennie had transformed her life and enabled her to enjoy a degree of independence. She thanked Rotary for their generous support. 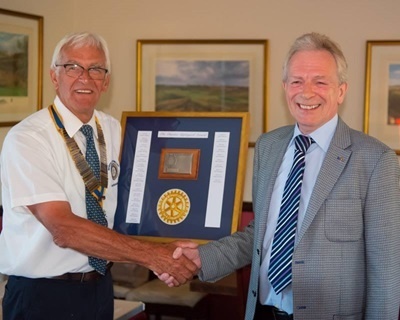 Summing up a most successful event, Peter Boxall announced the date of Rotary’s Annual Charity Golf Day in 2019 – Monday 3rd June, at Naunton Downs Golf Club. 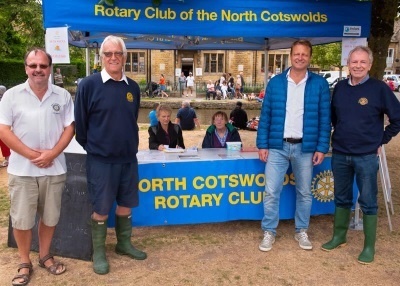 On Saturday 12th May on the green at Bourton-on-the-Water members and friends of North Cotswolds Rotary Club offered passers-by the opportunity to have their blood pressure checked, free of charge. One in 5 women and 1 in 6 men will have a stroke by the age of 75, so regular check-ups are an important way to minimise the risk of a stroke. A total of 70 people had their blood pressure checked, and of these 11 were advised to see their GPs to have their blood pressure reviewed and monitored. Our thanks to our team of helpers, including Dr Gina Hadley and several former nurses. 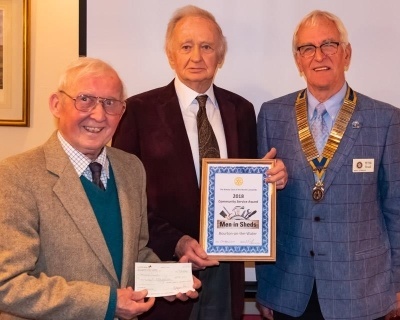 North Cotswolds Rotary Club presented their annual COMMUNITY SERVICE AWARD to MEN IN SHEDS in Bourton-on-the-Water, in recognition of the help they give to the local community in various ways. The Bourton Shed has been going for some two years, and has around 23 members. In its first year it won the National Association's New Shedders of the Year Award. 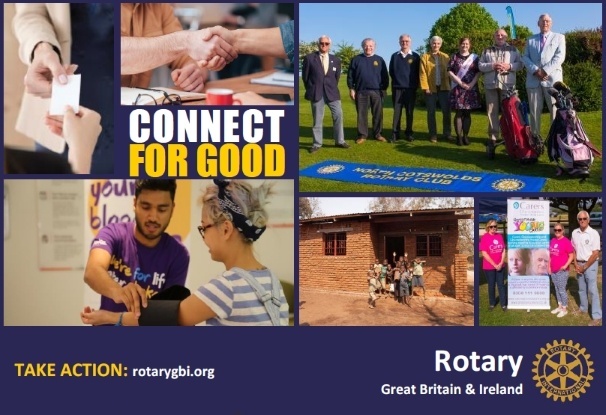 The Bourton Shed, based at the Royal British... Legion Hall, is where men come together every Friday morning between 10am and 12.30pm to provide social interaction for members and a service (by means of projects undertaken) to the local community. The picture shows club president Peter Boxall presenting the award to Howard Crook and Pryce Watkins. 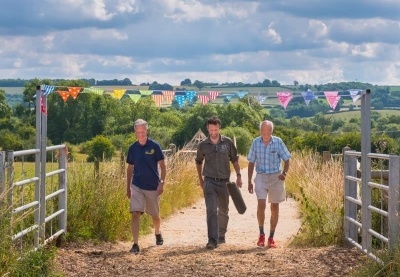 Congratulations to Men in Sheds for the good work that they do. 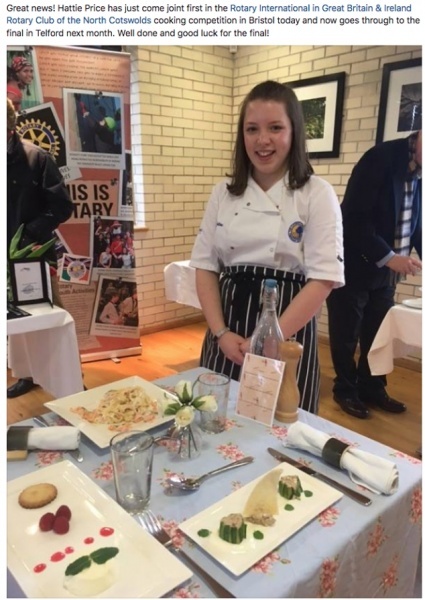 Many congratulations to Hattie Price from The Cotswold School in Bourton-on-the-Water for a fantastic achievement in winning the Regional Final (Districts 1060, 1100, 1150, 1210) of the ROTARY YOUNG CHEF competition, which took place in the impressive surroundings of the Abraham Darby Academy, Telford, on Saturday 17th March. Hattie's delicious menu consisted of Smoked mackerel pate with watercress and melba toast; Salmon tagliatelle with creme fraiche and dill (and she made her own pasta); Vanilla panna cotta with a raspberry coulis and shortbread. She received her award from District 1210 Governor, Carol Reilly. 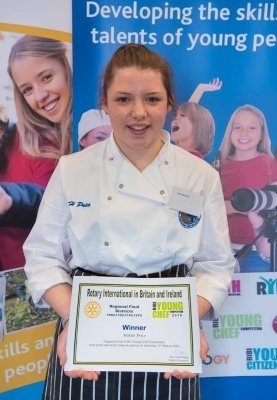 North Cotswolds Rotary wish her every success in the National Final on 28th April – we are very proud to be sponsoring you. 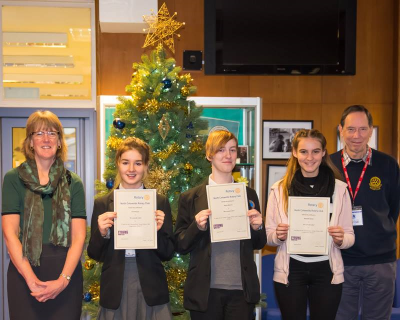 Congratulations to The Cotswold School Interact Club who, from the money they have raised so far, presented two cheques each for £75.00, to Cotswold Carers (Moreton), and Hop, Skip and Jump (Seven Springs). Excellent work, well done! 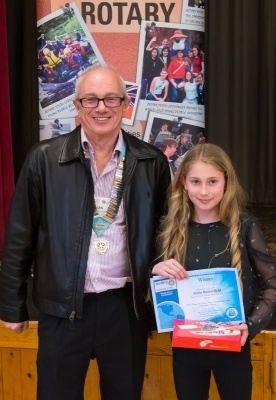 Congratulations to Alexa Butterfield from The Cotswold School, seen here receiving her award as winner of the District 1100 Final of the Young Writer Competition, (Intermediate age group). Prizes were presented by District Governor Alan. We wish Alexa good luck for the National Final to be held in the summer. 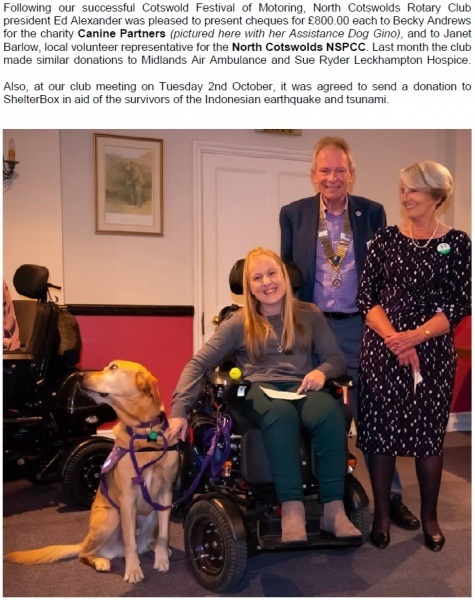 The Club hosted an inspirational talk given by Colette Kilmister, accompanied by her Assistance Dog - Jennie - a ten-old Labradoodle. Colette told members and guests how Jennie "gave me a life", by enabling her to enjoy a degree of independence and ther grow in confidence and self-esteem. She has had Jennie foreight and a half years, and it was clear for all to see what a strong bond there is between them. With Jennie by her side Colette is able to go shopping in her motorised wheelchair, with Jennie fetching items from the shelves and putting them in a basket. Jennie also helps with opening and closing doors, and she even operates the washing machine! She can open the fridge, and opens drawers or fetches the telephone when asked to do so by Colette. And of course, she is a wonderful companion. The life cost of an Assistant Dog from puppy to retirement is about £20,000.00. Currently there are around 300 Assistance Dogs in Britain, but the demand is much greater than this. 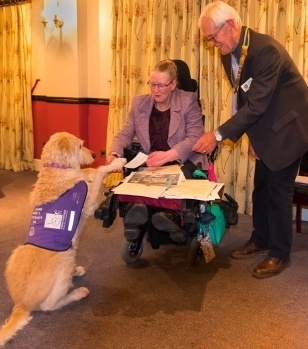 After the talk, club president Peter Boxall handed Colette an initial cheque for Canine Partners for £200.00, and the charity will also benefit as one of the principal charities from our Annual Golf Day in June. Our Christmas Collections at TESCO Stow on the Wold and CoOp in Bourton-on-the-Water raised over £1,600.00 for our chosen charities. 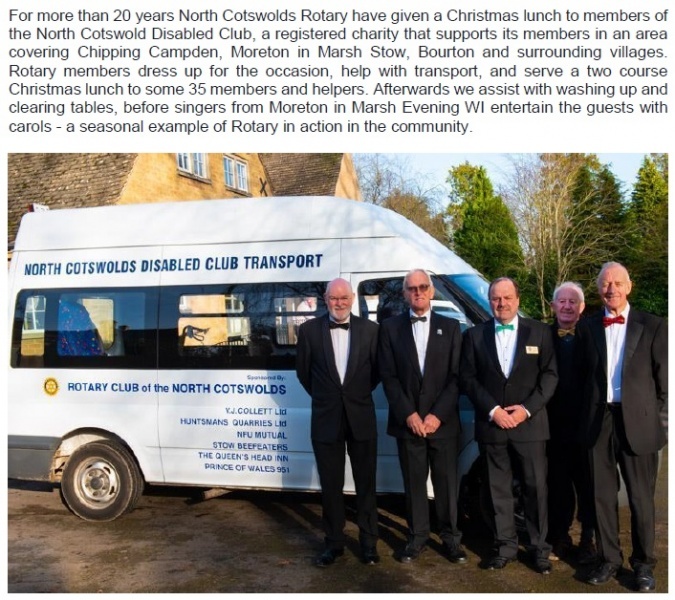 North Cotswolds Rotary Club (NCRC) is pleased again this year to support 'Community Awareness', a local charity, in the excellent work they do to bring a little bit of Christmas cheer to underprivileged children and their families in the North Cotswolds. 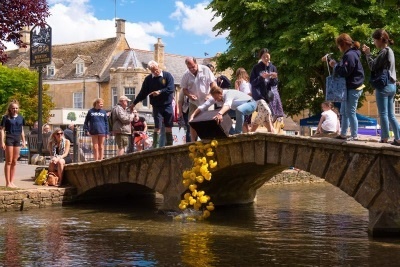 Low income families do not have savings or spare money to spend on gifts or even fresh food, and a recent report found that, surprisingly, the Cotswolds is the second worst area in the country to be poor. With the help of a donation from NCRC, Community Awareness has provided 180 local children from such families with a Santa-Sack of toys, stationery, books and games, and a further 80 families with bags of fresh fruit, vegetables and groceries. 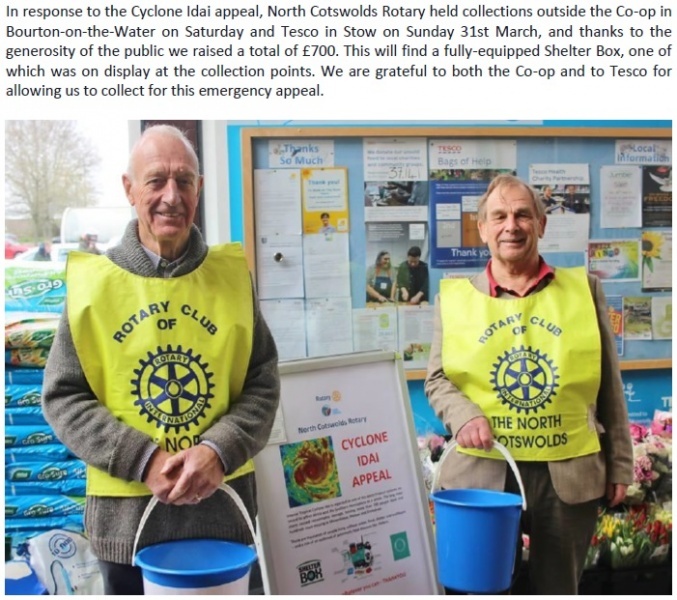 Well done to all volunteers with Community Awareness, Rotary is pleased to support your good work. 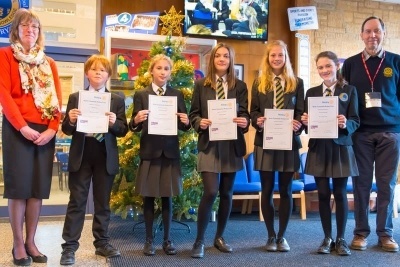 The first round of the Rotary Young Writer competition held at The Cotswold School has just been completed. The subject this year was a challenging one - 'A Different Perspective'. 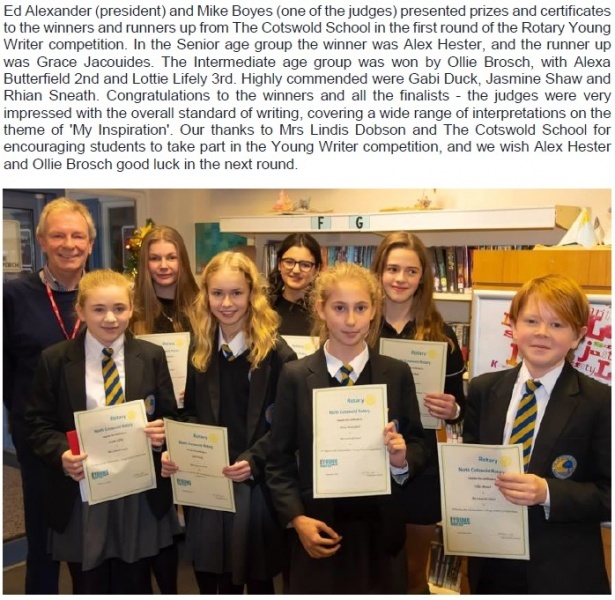 There were over 150 entries from The Cotswold School in the Intermediate and Senior age categories, and among these were some excellent pieces of work, showing both imagination and good written English, both prose and poetry. Congratulations to the winners and runners up, and those commended: Seniors - 1st, Bethan Powell; 2nd, Charlotte Davis; Intermediates - 1st, Alexa Butterfield; 2nd, Victoria Kennedy; 3rd, Ollie Brosch. Highly Commended were: Alessandro Griffini, Lorna Finnimore, Jasmine Shaw. Our thanks to all those who took part, and to Lindis Dobson and teachers in the English department of The Cotswold School. Good luck to the winners in the next round. In early November two sixth formers from The Cotswold School, Frankie Deverell-Jones and Carla Terroba-Taylor spoke to Bourton-on-the-Water Primary School’s assembly, to offer the children an exciting opportunity to take part in an art competition. Over 100 pupils took part, and Sam Redding won. a drawing competition run by the Rotary Club of the North Cotswold . 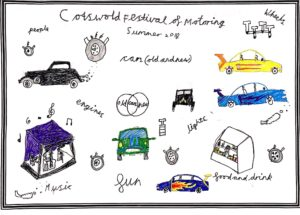 There were well over 100 entries and Sam’s entry was deemed by a panel of 5 judges to be the best as it had some splendid drawings and really captured the range of things described in the brief – “what will the Cotswold Festival of Motoring be like?” Pupil Sam Redding was judged the winner - He won a certificate, Rotary pen and a £20 Amazon voucher. 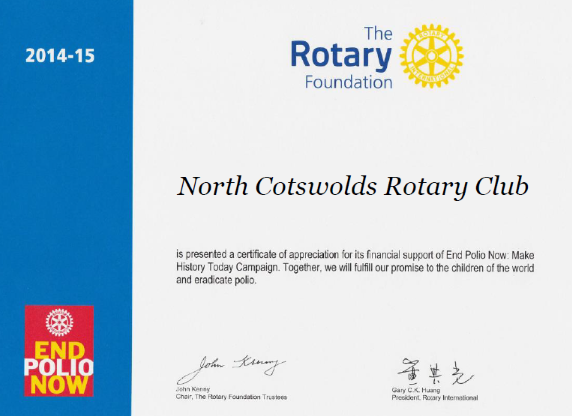 There were certificates for all entrants and each year group winner received a North Cotswold Rotary Club Pen. 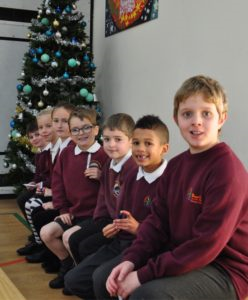 The winning row – 7 pupils with their Rotary pens. 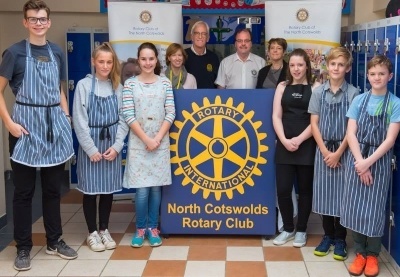 A first round of the Rotary Young Chef Competition took place at The Cotswold School on Saturday 11th November. 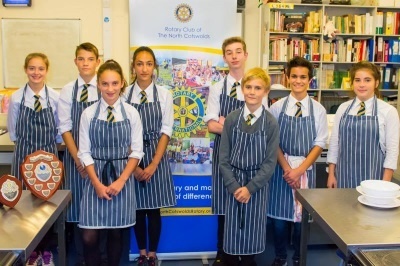 Six students - Alice Cannon, Henry Cannon, Peter Hoole-Jackson, Ed Parker, Hattie Price and Florence Sumner - took part, and they served up some excellent dishes for the judges - Rotarians Peter Boxall and Bob Hadley, with Amanda Everitt and Caroline Wrightson - to taste. Picking a winner was not easy, but in the end the judges chose Hattie Price, and in second place was Ed Parker. Congratulations to Hattie and Ed, and to all who took part. 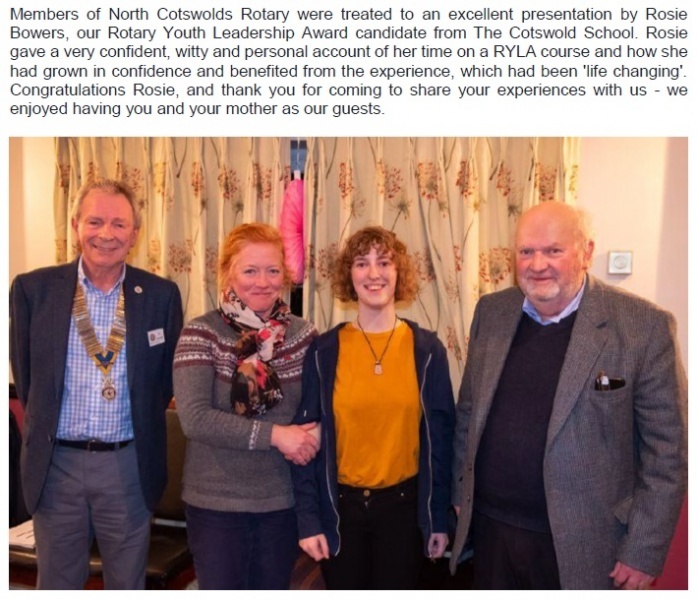 North Cotswolds Rotary Club would like to thank Cath Lamb and The Cotswold School for organising this competition, and the judges for their time and their helpful comments and feedback to the students. We wish good luck to Hattie and Ed in the next round, which takes place early next year. for up to date news and how to register a vehicle etc. 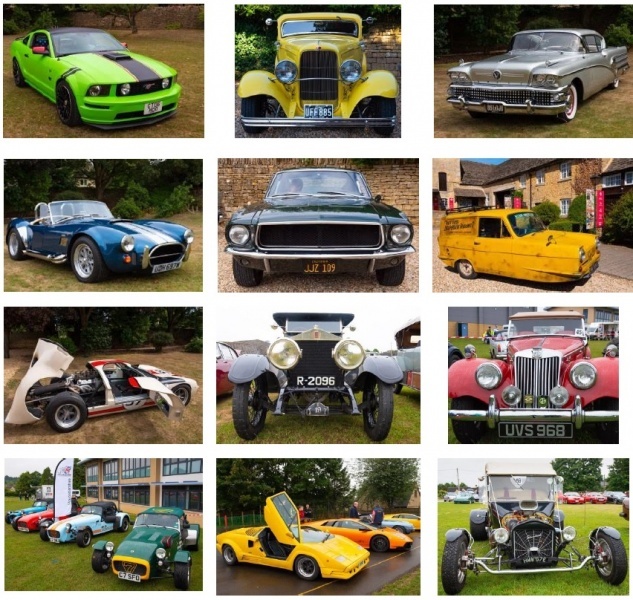 The Cotswold Festival of Motoring 2018 will support 4 Charities: Midlands Air Ambulance Charity, Sue Ryder Leckhampton Hospice, NSPCC and Canine Partners. 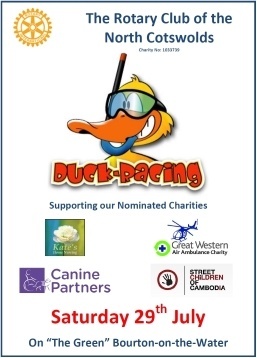 With the invaluable co-operation of Warner’s Budgens in Moreton in Marsh, on Friday 6th October North Cotswold Rotary Club organized a collection in aid of its nominated charities for 2017 / 2018 - Kate’s Home Nursing, Great Western Air Ambulance, Canine Partners and Stella in Cambodia. Over £300.00 was raised. Our sincere thanks to all who gave so generously. Peter Boxall, our Club President welcomed an audience of Music lovers to the 10th annual "Youth and Music" concert held in St. Edward's Church, Stow-on-the-Wold. 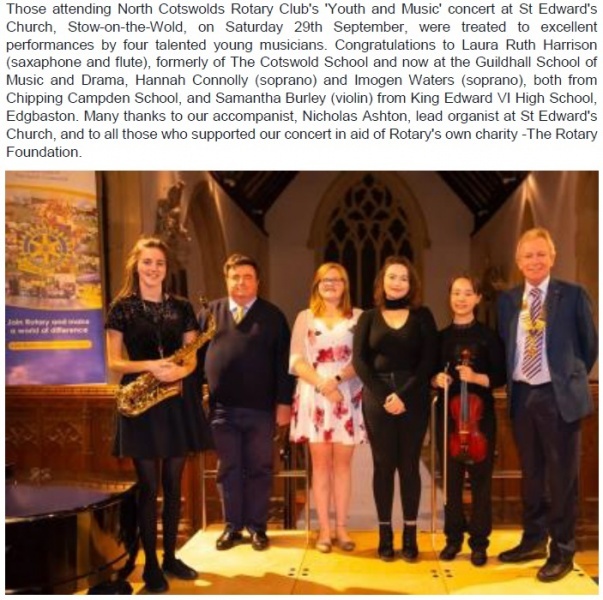 The concert involved young talented musicians, many of whom have been successful in Rotary Young Musicians competitions held in the local area earlier in the year, and is held in aid of Rotary Foundation. It is hoped that this year's event will have raised in the region of £700.00 for the charity. 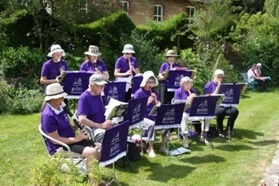 The concert included two wind ensembles from the Cotswold School in Bourton on the Water. "Triple Time" a group of clarinet players, joined with the "Flutets" to open the concert. Also from Cotswold School was Grace Clare who entertained by playing the clarinet. Two pianists, Michael Lei and Kimberley Mok, both successful in the Rotary's Young Musicians competition held in Cheltenham in March enthralled the audience with their playing. Finally, the concert welcomed back Laurence Kilsby (tenor), now studying in London at The Royal College of Music. 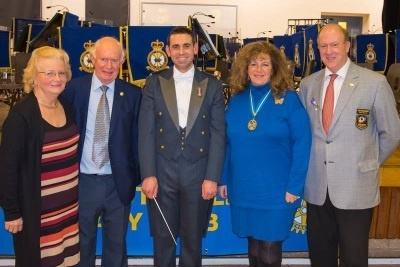 Laurence started his singing in a junior choir in St. Edward's when he was very young and has succeeded, through becoming choir boy of the year, a few years ago, to his now studying at RCM. His competence as a tenor was fully demonstrated with his performance. 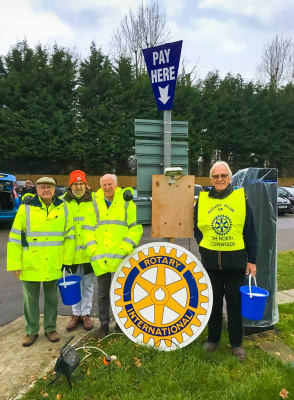 North Cotswolds Rotary Club raised just under £1200 from collections outside Tesco in Stow on the Wold and the Co-op in Bourton-on-the-Water. 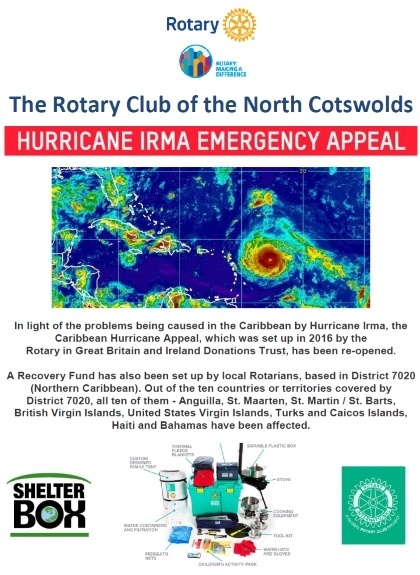 The money raised will go to the charity 'ShelterBox', to provide emergency shelter for the victims of Hurricane Irma in the Caribbean, and elsewhere. Our thanks to the public for their generous support, and to both Tesco and the Co-op for giving us permission to hold these collections at short notice. 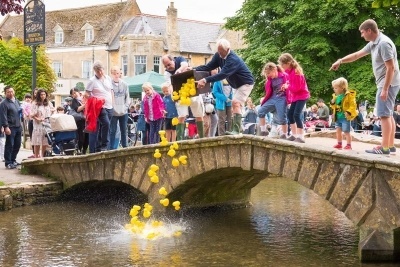 Our annual Duck Racing on the green at Bourton-on-the-Water raised just over £1300 towards the club's four principal charities this year - Kate's Home Nursing, Great Western Air Ambulance, Canine Partners, and Street Children of Cambodia. Footfall was down due to the weather which looked threatening but stayed dry long enough to complete 12 races at half-hourly intervals. Families with young children enjoyed the event, which also proved popular with tourists from Europe and as far afield as Japan and South Korea. 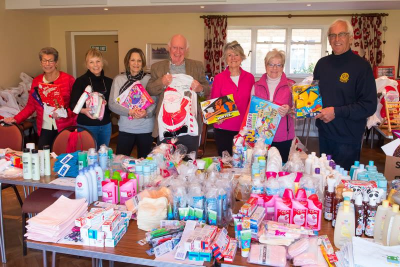 Our thanks to Bob and Sue Hadley, Janet Prout, club president Peter Boxall, Irene Summers, Ronnie Wright from the Rotary Club of Coatbridge, Airdrie and Monklands, and to all who helped on the day. 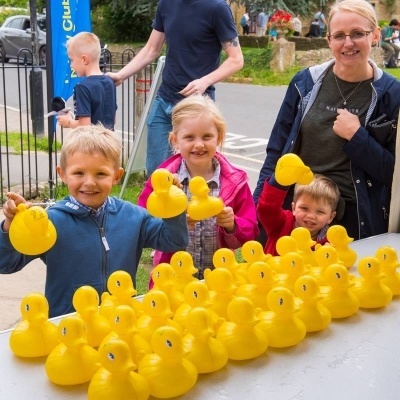 This event is very much a fun community event for all the family - and among those enjoying a day out were Keegan Wherlock, Emily and Alfie Shaddick, and Vikki Wherlock, pictured here. (Photograph reproduced by kind permission). 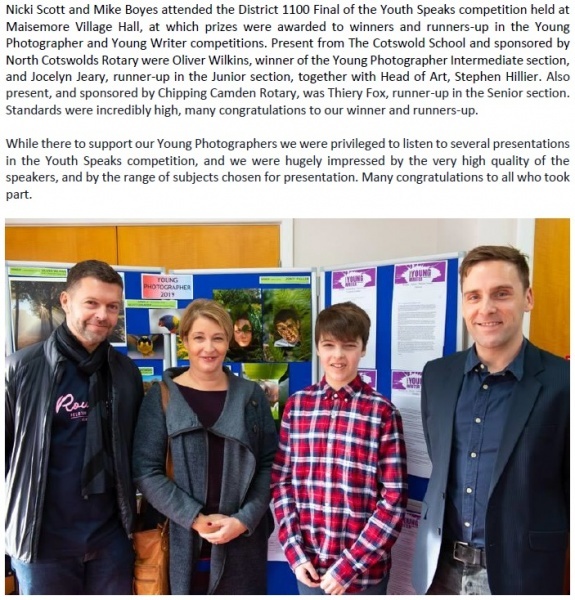 To encourage and foster young talent North Cotswolds Rotary Club sponsors a Young Artist Competition at The Cotswold School, and this year standards were exceptionally high. 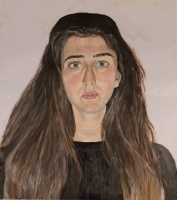 The theme was Portraiture, and joining Bob Hadley and Mike Boyes to judge the competition was Emma Gorton, an artist herself and formerly a student at the school. The judges were most impressed with the very high standards achieved at every level, with work showing both technical competence and considerable imagination, and also conveying in many cases emotion and feeling. Entries were judged in three age groups:- Key Stage 3 - GCSE; and Years 12 & 13. The Key Stage 3 winner was Isabel Kiey-Thomas, with Callam Woolley 2nd. 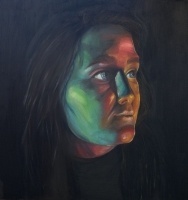 At GCSE level, the winner was Esme Palmer, with Hal Pett 2nd. Megan Webster won the Years 12 & 13 group, with Agnes Von Kindt Rohde 2nd. 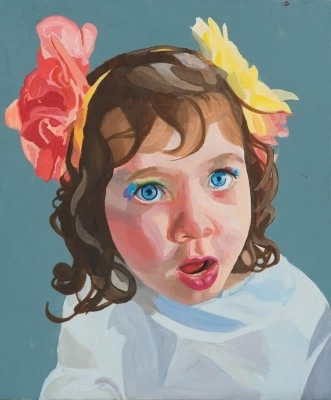 The overall winner was Esme Palmer with a charming portrait of a young girl with flowers in her hair. Congratulations to the winners and runners-up, and to all who took part - you are all a credit to The Cotswold School. 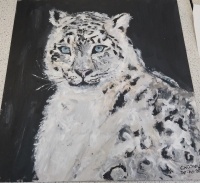 Our thanks to Emma Gorton, to Art Teacher Mrs. Amy Wardell, and to those students who have given permission for us to show their outstanding work here and in the press. Many more excellent paintings deserve to be shown, but as of now we do not yet have permission to do so. 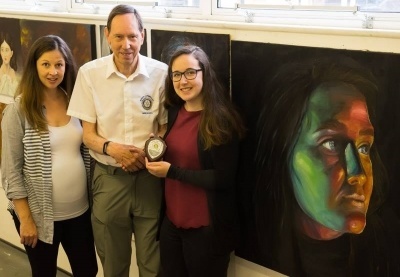 The final picture shows Megan Webster receiving her Year 13 winner's shield from Mike Boyes, with Amy Wardell. Megan has now left The Cotswold School, and we wish her well for the future. 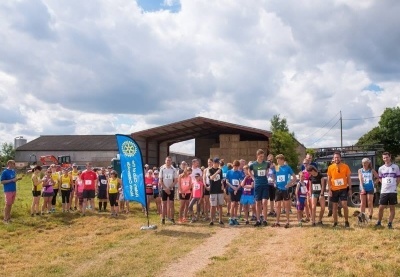 North Cotswolds Rotary Club and Gloucestershire Wildlife Trust (GWT) organised their first annual charity 10k run and walk at Greystones Farm, Bourton-on-the-Water, on Sunday 9th July. 75 runners and walkers took part in what turned out to be an incident-packed event. For a while a large swan blocked the route along a narrow path, and someone unknown turned a direction sign around, causing confusion to the leading runners. Despite these complications, those taking part thoroughly enjoyed them-selves and have said they are looking forward to taking part next year. This was as much a fun community event as it was a fundraiser for GWT, and the hope is that it will encourage more people to enjoy the great outdoors and appreciate the importance of conserving the natural environment for generations to come. £300.00 was raised to support GWT's improvements at Greystones. Congratulations to the winner, Luke Pennington, aged 14, and to the first lady to finish, Rosie Mutsaars, who also came 4th overall. 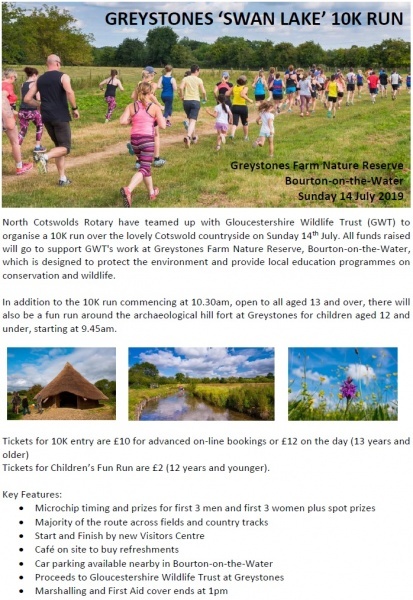 We would like to thank all who took part, all volunteers who helped on the day, Bourton Road Runners for their help and advice, and Gloucestershire Wildlife Trust for allowing us to hold this event in the beautiful surroundings of Greystones Farm Nature Reserve. Colin Gatenby hosted his President's Night at the Wyck Hill House Hotel on Friday 23rd June. During a most enjoyable evening Colin handed over the presidency to Peter Boxall, and Peter's successor next year will be Ed Alexander. 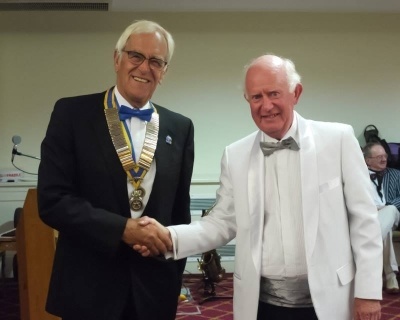 Paul Harris Sapphire awards were presented to Brian Honess for all he has done with the District Young Musician competition over many years, and to Bob Hadley for all his work with Rotary Youth competitions at The Cotswold School. The Charles Appleyard Award for the most outstanding contribution to the club during the past year was presented by Colin to Keith Jacob who has worked tirelessly to support club activities with excellent PR material, and for successfully organising the Christmas Charity Band Concert. Congratulations and thanks to Colin on a successful year, to Peter and Ed as they take up office, and to Brian, Bob and Keith for their excellent service on behalf of the club. 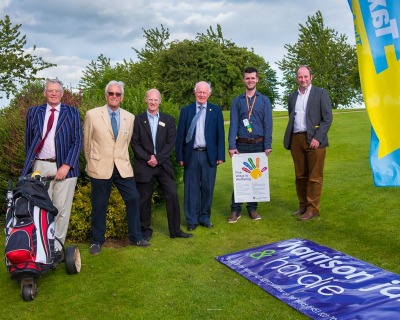 North Cotswolds Rotary Club held its 22nd annual Charity Golf Day at Naunton Downs Golf Club on Monday 12th June, and since 1995 some £83,000 has been raised for various charities. 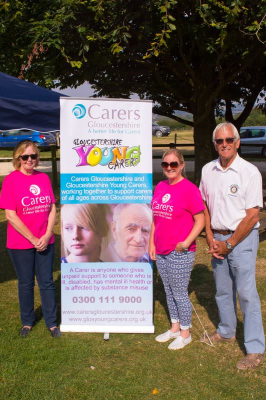 This year 56 golfers took part and a around £4500 was raised, to be split between four charities - Gloucestershire Young Carers; Swindon. MIND (Alexandra Wellbeing House, Gloucester). 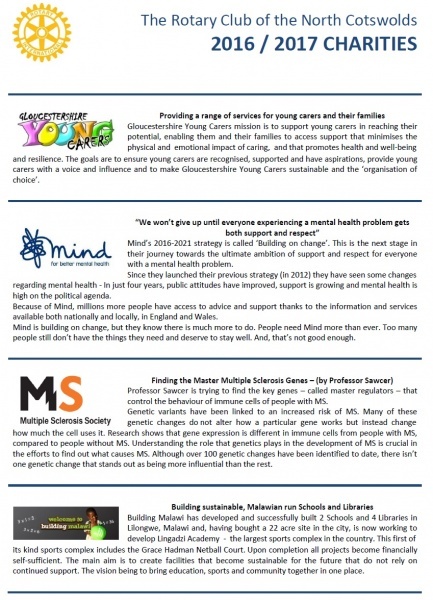 The Multiple Sclerosis Society, (for Professor Sawcer's important research trying to find key genes that control the behaviour of immune cells). Also a small international charity - Building Malawi. The Individual Winner was Stuart Mitchell, with Guy Padgham as runner up. Dawn Rimmer won the prize for the best Ladies Score and Neil Rimmer won the Clifford & Webb Cup for the best Rotarian Score. The Team prize was won by Peter Dunckley, Stuart Mitchell, Stuart Rushworth and Mark Salf. Among the other winners was 17-year-old Sam Prout with the Longest Drive, a commendable effort. Congratulations to the winners and all who took part, and our grateful thanks to Naunton Downs Golf Club for allowing us to play on their lovely course, and to all our generous sponsors. 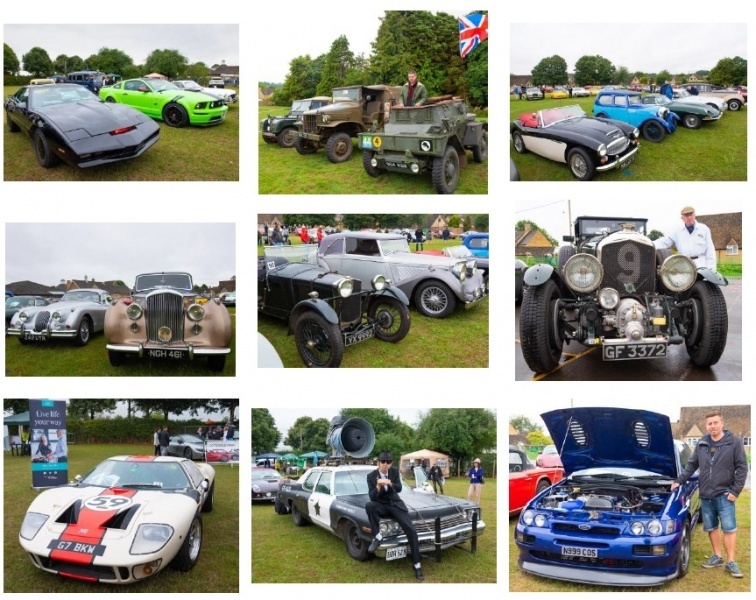 Also a big thank you to Bryan Sumner and his team of helpers for organising this event and making it such a success - both for those who participated, and for the four charities. 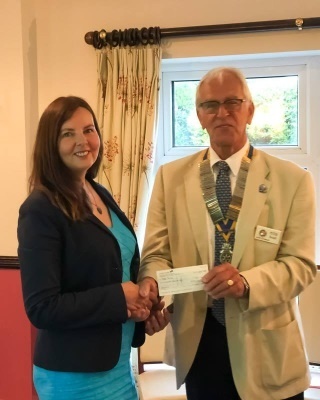 North Cotswolds Rotary Club and the Ladies Section of Naunton Downs Golf Club joined together for the evening to hear an excellent talk by Katie Roberts, Research Communications Officer at the MS Society, on the latest developments in MS research. Over 100,000 people have MS in the UK, and the MS Society funds between £4m and £5m per year in MS research. Katie explained what treatments were currently available for those with either relapsing or progressive MS, and what avenues of research were being pursued into finding ways to combat and eventually stop MS.
One of club president Colin Gatenby's chosen charities for this year is the MS Society (with donations going to fund research), and the Lady Captain of Naunton Downs Golf Club, Gill Ashton, has also chosen MS as her charity for 2017, with emphasis on the needs of local MS sufferers. Our thanks to all concerned for a most enjoyable and informative evening. 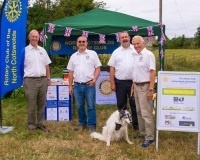 Pictured left to right: Andy Jarrett, Severn Vale Rotary Club, who works for the MS Society in Gloucestershire; Katie Roberts; Colin Gatenby; Gill Ashton. 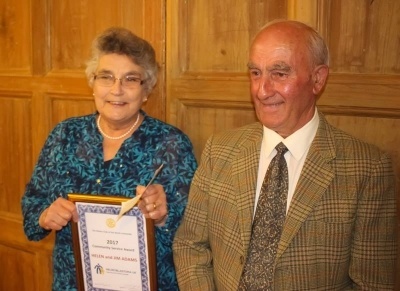 North Cotswolds Rotary Club was delighted to present Helen and Jim Adams with its Community Service Award for the year. 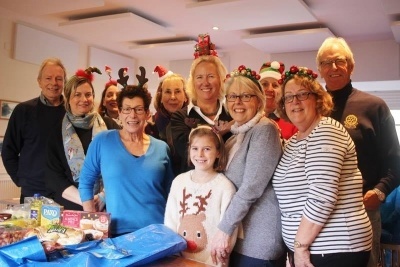 Helen and Jim, who live in Clapton-on-the-Hill, work tirelessly for charities and organisations in the community, raising money and allowing the use of their premises for fundraising activities and local events. 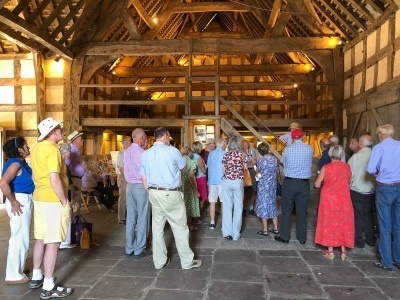 Recently, they have raised considerable sums for Neuroblastoma UK, a charity devoted to the relief of suffering for children with cancer - to name just one of the causes they have supported. 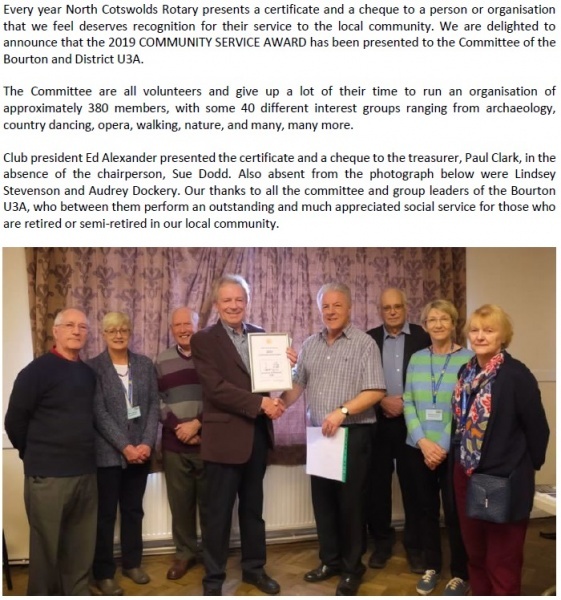 Club president Colin Gatenby presented Helen and Jim with a plaque commemorating their award and a cheque for £250 to give to a charity of their choice. Rotarians on target and enjoying a great day out with Archery at Batsford Arboretum. 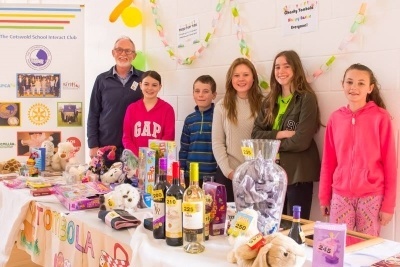 Congratulations to The Cotswold School Interact Club, whose members ran a tombola stall at Upper Rissington over Easter and raised £158 for their nominated charities. 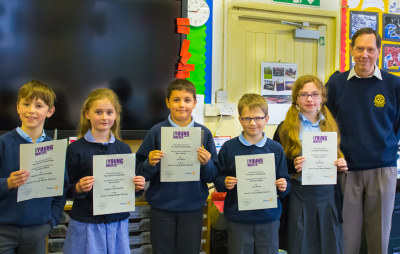 Pictured, from the left are: Rotarian Andrew Mitchell, Nadine Jones, George Whitley, Megan Gibson, Olivia Bonner and Daisy Keen. Also pictured is the club banner designed by Interact members. Good effort everyone, well done! 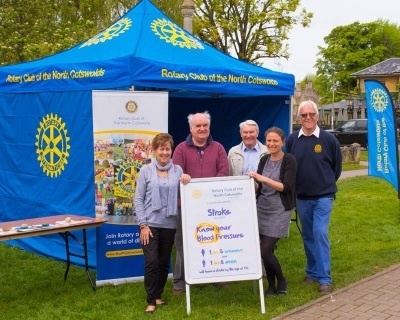 North Cotswolds Rotary took part in Know Your Blood Pressure day in Bourton-on-the-Water on Saturday 22nd April. The purpose of the day, run with the support of the Stroke Association, is to raise awareness of the link between high blood pressure and an increased risk of having a stroke. A total of 73 people had their BP checked and of these, four were advised to seek medical advice. Twenty-two Rotarians and friends helped to run the event, several of whom were medical practitioners or former nurses. Our thanks to all who helped to make the day a success. 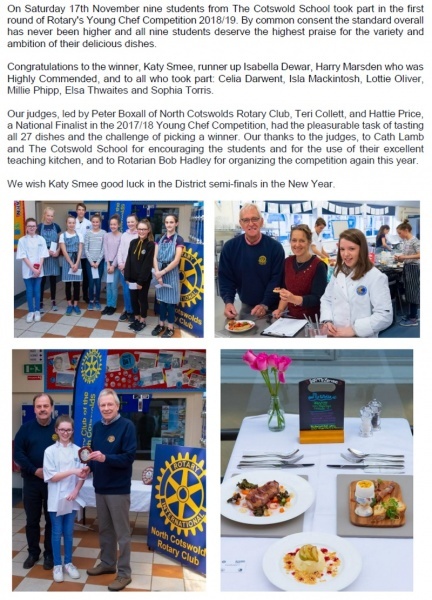 One of two District semi-finals of the Rotary Young Chef competition took place at The Cotswold School on Saturday 21/01/17. As always standards were impressively high, and we are delighted that two Cotswold School students came first and second - Lucas Butler winning, with Grace Francis second. Both go through to the District Final, also at The Cotswold School on 25th February, along with Finn Justice (sponsored by Cirencester RC) who came third. Congratulations to all who t...ook part and good luck to all three going forward to the next round. 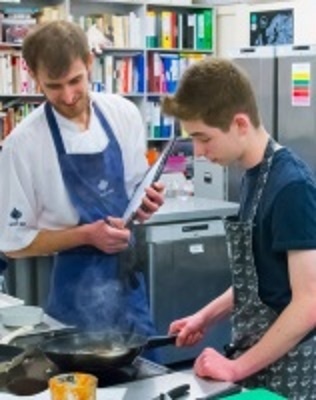 We would like to thank The Cotswold School for hosting the semi-final, and we are most grateful to The Lucky Onion Group for providing two of the three judges - Al Gleeson, Head Chef, and Jason Gibbs, Chef de Partie, both at No 131 The Promenade, Cheltenham. We very much appreciate their professional advice and support. 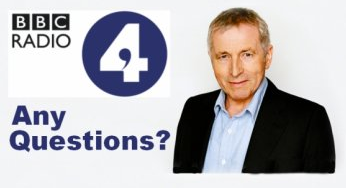 North Cotswolds Rotary Club values its many links with The Cotswold School in Bourton-on-the-Water, which Jonathan Dimbleby in 'Any Questions' tonight called "the finest secondary school in the land". 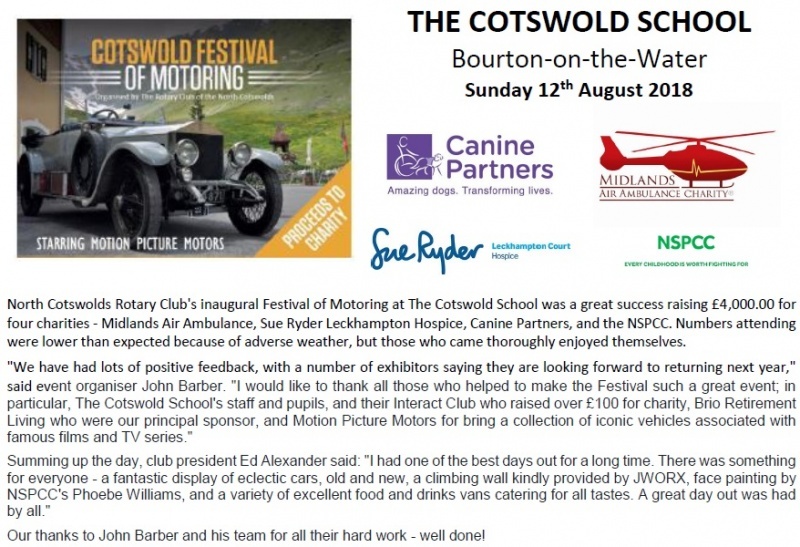 Congratulations to The Cotswold School. 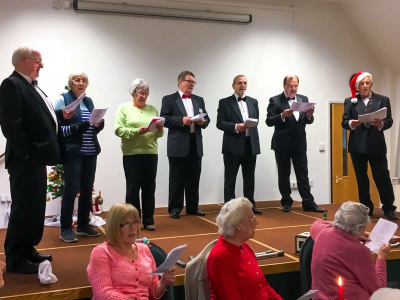 North Cotswolds Rotary Club dressed up in dinner jackets to serve and entertain some 35 members of our local Disabled Club (together with some of their helpers and friends) to a Christmas lunch, followed by a rendition of some well-known Christmas carols, at Broadwell Village Hall. This is a pre-Christmas tradition that goes back many years and is greatly appreciated by all those who attend. 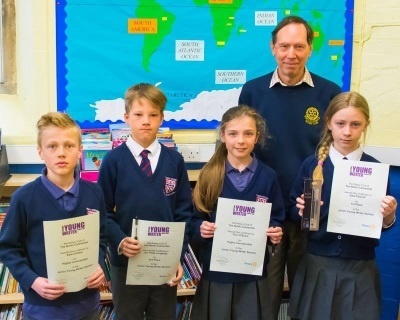 Congratulations to the winners and runners-up in the Rotary Young Writer competition at The Cotswold School. Standards were impressively high with many of the entries showing considerable imagination and some commendably fluent writing, on the theme of 'Reflection'. The Senior age group winner was Rosie Bowers. In the Intermediate age group the winner was Eleanor Plater, with Mariola Rosser second ..... and Dolly Forrester third. 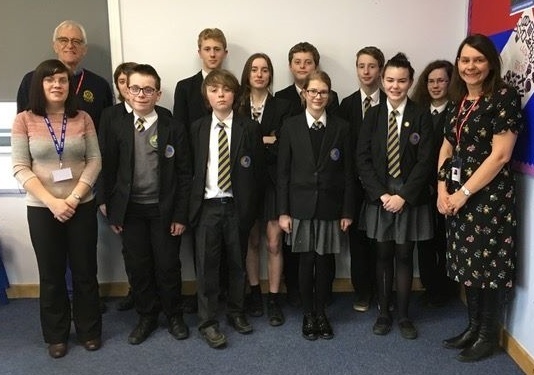 Our thanks to English Teacher Mrs Lindis Dobson for her help in organising the competition, and we wish good luck to the winners in the next round, and a speedy recovery to Eleanor who was unable to attend the presentation. Pictured (L to R): Mrs Lindis Dobson, Dolly Forrester, Rosie Bowers, Mariola Rosser, Rtn Mike Boyes. 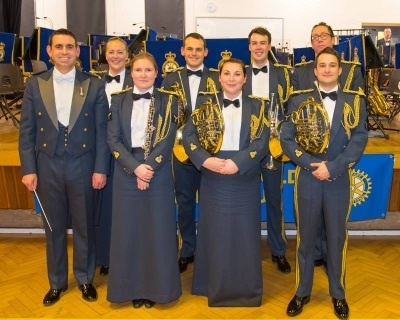 Christmas festivities got off to a flying start with the return of The Band of the Royal Air Force Regiment playing a varied programme of music at North Cotswolds Rotary Club's 30th Anniversary Christmas Charity Band Concert. 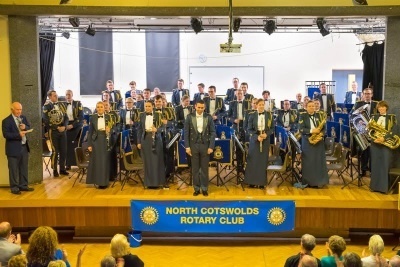 The concert took place at The Cotswold School in front of an audience of over 300, and we were delighted to welcome as guest of honour The High Sheriff of Gloucestershire, the Rt. Hon. Countess Bathurst. 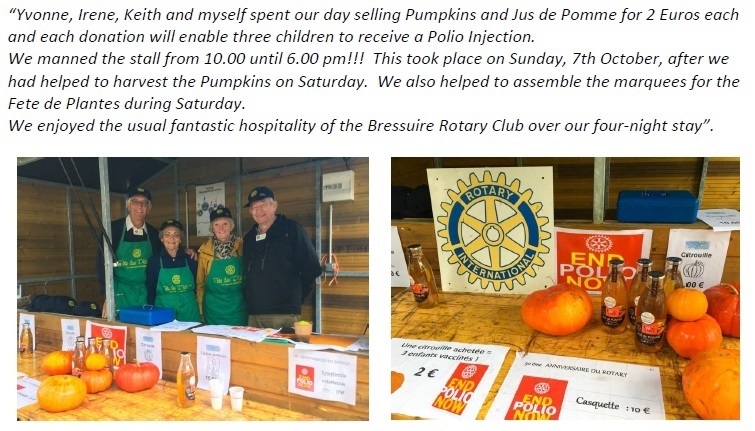 Also in attendance was District Governor Richard Purdon, together with members of The Cotswold School Interact Club whose help in selling programmes was very much appreciated. 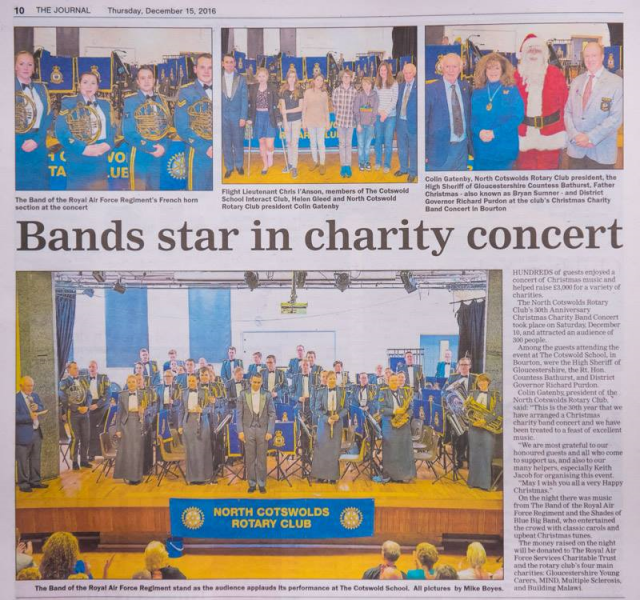 Provisional figures indicate that the concert raised Â£3000.00 for charity, with half going to The Royal Air Force Music Services Charitable Trust, and the remainder being divided between the club's four principal charities - Gloucestershire Young Carers, MIND, Multiple Sclerosis, and Building Malawi. Our thanks to all our helpers. 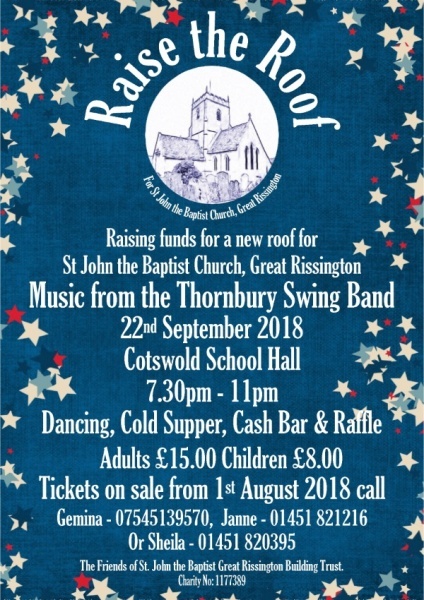 supporters, and our guests - The Band of the Royal Air Force Regiment for a wonderful evening of entertainment, and also The Cotswold School for the use of their facilities. 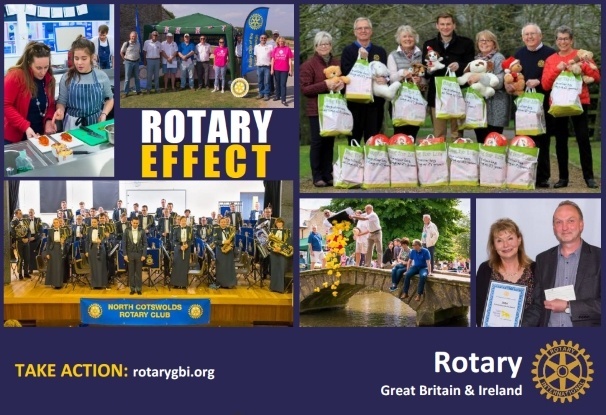 North Cotswolds Rotary Club is very pleased to support a very worthwhile local voluntary group - Community Awareness - who provide much-needed assistance for children from deprived families. At Christmas Community Awareness put together gift sacks - for 130 children this year - and the most deprived families also receivefresh meat, fruit and vegetables over the Christmas period. 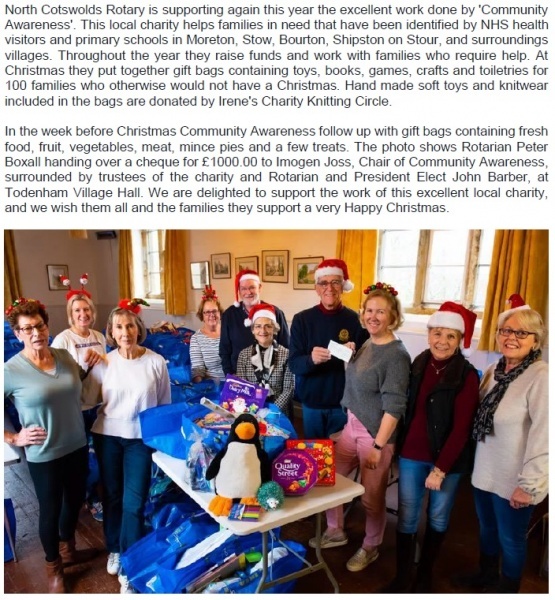 North Cotswolds Rotary Club donated Â£1,250.00 to help make possible the provisioning of these Christmas Gift Sacks, and we visited the group as they assembled the sacks in Evenlode Village Hall. 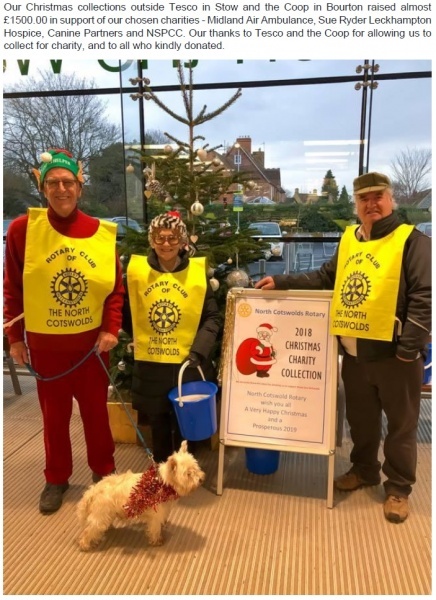 Many club members and friends turned out to direct the traffic and collect money from motorists for charity at Bourton-on-the-Water's Late Night Shopping event on Friday 2nd December. The sum raised was Â£1,640.00 - our thanks to all who braved the cold to help raise funds for our nomoinated 2016 / 2017 club charities. 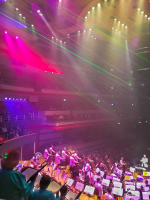 Club members and friends enjoyed a wonderful 'Spectacular Classics' concert performed by the CBSO in Symphony Hall in Birmingham on Saturday 12th November, modelled on the Last Night of the Proms with the addition of a spectacular laser light show. An excellent social outing, full of entertainment, fun and friendship. 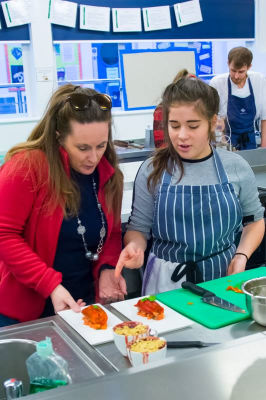 The first round of the Rotary Young Chef competition took place at The Cotswold School Academy on Saturday 5th November. The standards were impressively high from all eight contestants - Lucas Butler (winner), Grace Francis (2nd), Lauren Farley (3rd), Pau Gonzalez-Villamil Silva, Harry Marsden, Edward Parker, Nina Terroba-Taylor and Mollie Vadher. 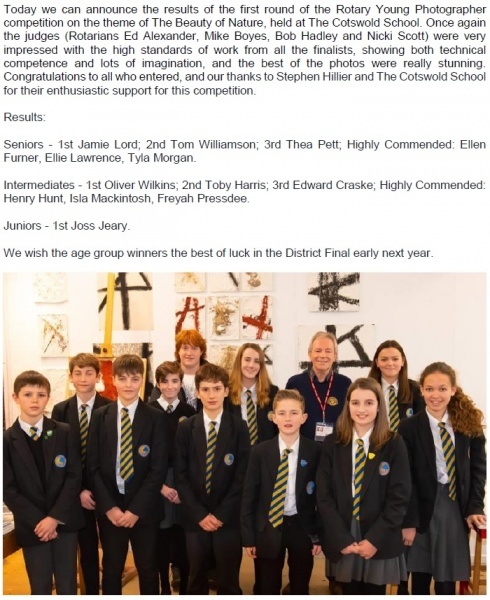 Congratulations to all the students who took part, and our thanks to Cath Lamb and Matt Smith of The Cotswold School for their work with the students, and to the judges - Jim Dee, Catherine Roffe and Bob Hadley; also to club president Colin Gatenby for his support. We wish Lucas all the best in our regional semi-final which will take place in January. On a sunny October day in Moreton-in-Marsh 13 intrepid (not so young) Club Members cycled a total of 102 miles in 6 hours – and got no-where! 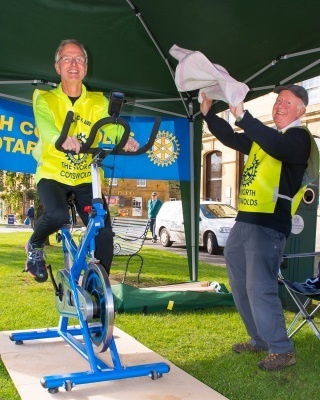 11 Rotarians cycled for half-hour, and two members for 15 minutes each. This was not a test of fitness, we were there to have fun in complete safety, and at the same time help several good causes that the club is supporting this year, (see details further down this page). And in the spirit of light-hearted fun Colin Gatenby (President), in the manner of a boxing second, waved a towel to cool down Graham Ogden as he put in a spurt towards the end of his half-hour stint. We are most grateful to members for taking part and to all who generously supported the riders. 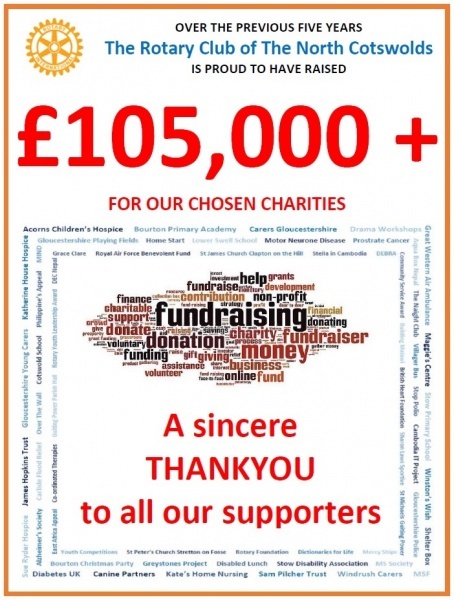 A total of Â£1,000.00. was raised. Mrs. Mary Cooper of Shipston-on-Stour who guessed that we would cycle 101 miles (Just one short of our total distance). 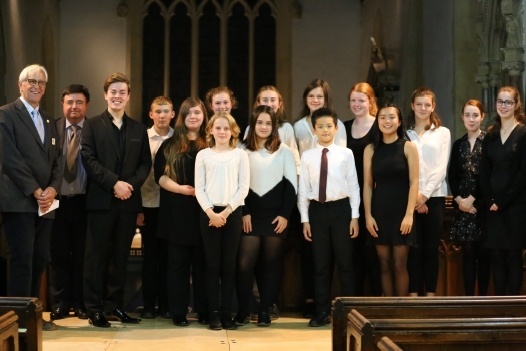 St. Edwards Church in Stow-on-the-Wold was filled with young talented musicians during the evening of Saturday 1st October. 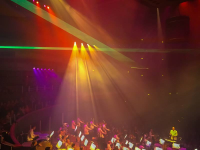 The line-up included a performance by the Wind Ensemble "Triple TIme", comprising of 10 musicians playing flutes, clarinets and bass clarinet - all from the Cotswold School in Bourton-on-the-Water. Their programme consisted of both classical and modern music. 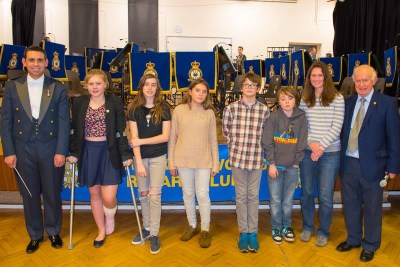 Additional soloists were drawn from Rotary's "Young Musician Competitions" in the North and South Cotswold districts. Hannah Brook-Hughes (14 years) is a hugely talented violinist. Hanah was also accompanied her younger brother (11 years) playing his cello. Katie Jenner (18 years) played both clarinet and saxophone. 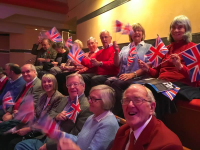 The concert raised Â£1,000.00 for The Rotary Foundation Centennary (Rotary's own Charity) – Thank you for a wonderful evening. 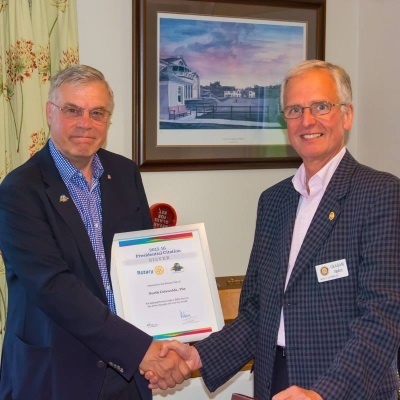 Our club members recently visited our friends at Lymington Rotary Club. Throughly enjoyed by all - especially a ferry trip to the Isle of Wight for an evening meal. Sincere thanks to all concerned for a great few days. 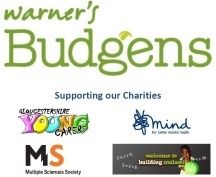 The generosity of shoppers at helped us raise nearly Â£400,00 during our recent Charity Collection at Warner's Budgens Supermarket. All of the kind donations will go to our chosen charities. 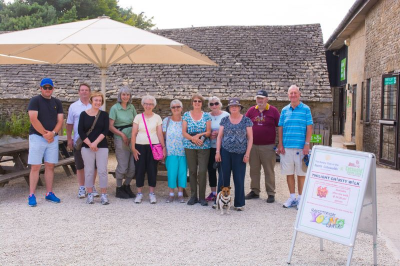 Walkers supporting our Twilight Charity Walk Cotswold Farm Park raised Â£500.00 for Gloucestershire Young Carers and enjoyed a very pleasant walk around the beautiful Cotswolds on a lovely summers evening. 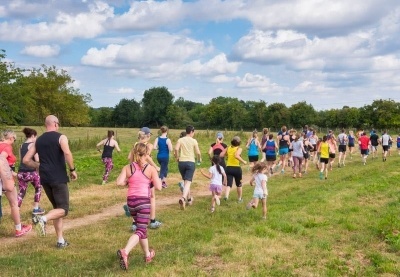 Our thanks to all who took part, to club members who acted as marshalls, and to Cotswold Farm Park for allowing us to access their land and facilities and for providing an excellent BBQ to round off a most enjoyable event. It was also a good opportunity to learn more about the charity from an adult young carer - Abbie Rich, who talked about some of the challenges and sacrifices made by young carers. 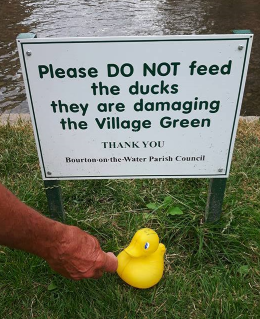 At Gloucestershire Wildlife Trust's Big Bourton Picnic held at Greystones Farm in Bourton-on-the-Water, North Cotswolds Rotary Club member Ernie Rumsey took PR and marketing to a new level! 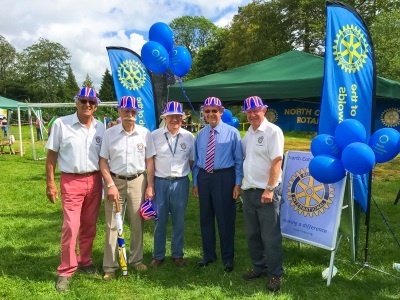 Club members attended this family fun day to promote Rotary. Around 400 people attended and thoroughly enjoy themselves. 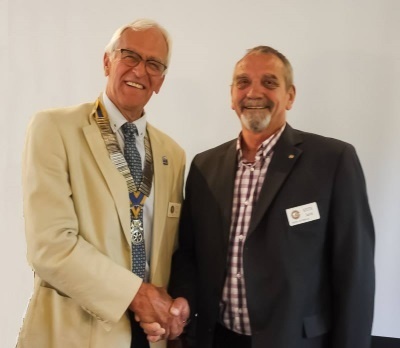 Past District Governor Tony Horn congratulated Graham Ogden for leading North Cotswolds Rotary Club through a successful year and achieving a Presidential Silver Citation in recognition of all that the club achieved during 2015-16. 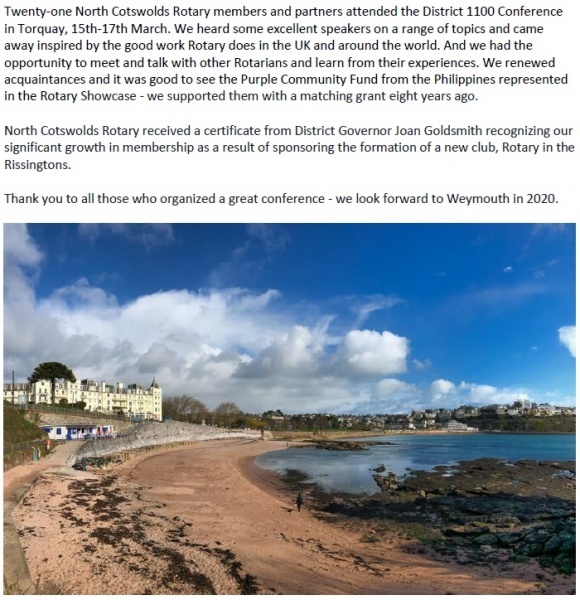 Well done Graham, and a big thank you from all members of North Cotswolds Rotary Club. To mix metaphors, 'Plastic ducks' rule the roost - they certainly float my boat! 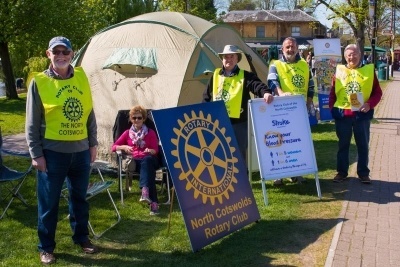 North Cotswolds Rotary Club raised more than Â£1200 for its four chosen charities - Gloucestershire Young Carers; MIND, Multiple Sclerosis Society; and Building Malawi. As reported in the Wilts and Gloucestershire Standard on 11th August 2016. 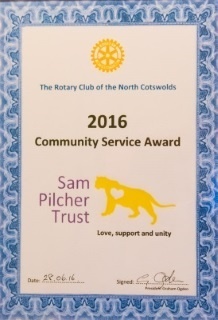 We are pleased to announce that the SAM PILCHER TRUST received the club's Community Service Award for 2016. 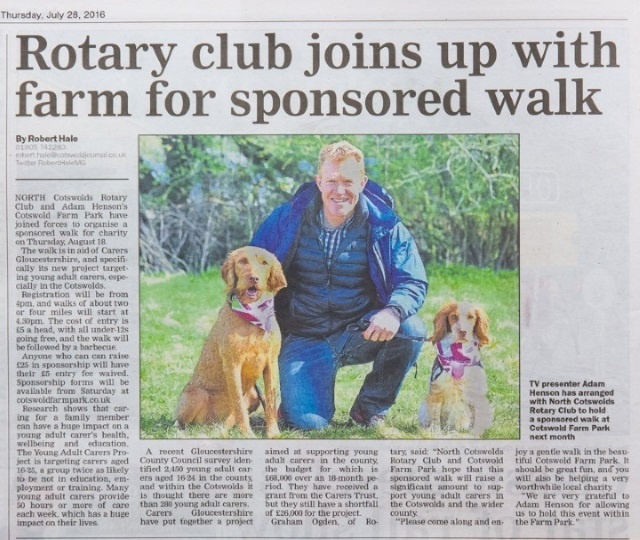 Club president Graham Ogden congratulated Colin and Terasa Pilcher for all that they have achieved since setting up the Trust in memory of their son, Sam, who died of cancer. The Trust helps and supports children with cancer and their families, and has helped to refurbish the Oncology Ward at Gloucester Royal Children's Hospital, and also the Adolescent Activity Room at Bristol Royal Children's Hospital, besides providing numerous grants to families in need with a child who has cancer. Well done, Colin and Terasa, and the Sam Pilcher Trust, you are doing wonderful work in the community and are very worthy winners of this award. 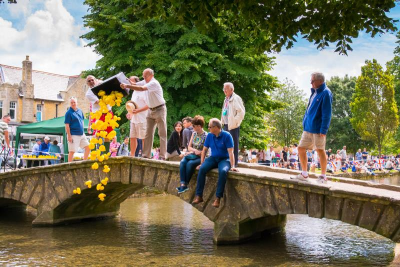 We entered into the spirit of the Bourton-on-Water's Family Fun Day to celebrate The Queen's 90th Birthday. 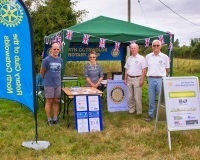 Our Rotary stand was visited by numbers of local people, some of whom took away our Club Newsletter and other Rotary Leaflets, and our games provided entertainment for parents and children alike. Lots of fun was had by all during a happy and successful local event. Congratulations to the winners, runners-up and all who took part in the Junior Section of the Rotary Young Writer Competition. From the left: Kyle Chilton, Joe Loughrey (2nd), Fern O'Brien, and Edie Pollock (winner). 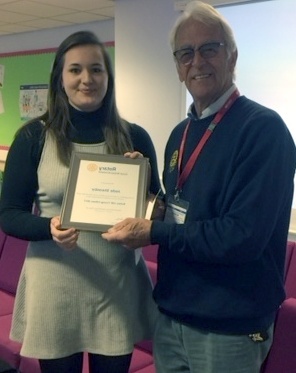 Chloe Rigby, highly recommended, was unable to be present to receive her certificate. From the left: Joseph Wells and Harriet Key - both Highly Recommended. Ben Collett (1st), Fletcher Watts (2nd), and Daisy Cooper (3rd). 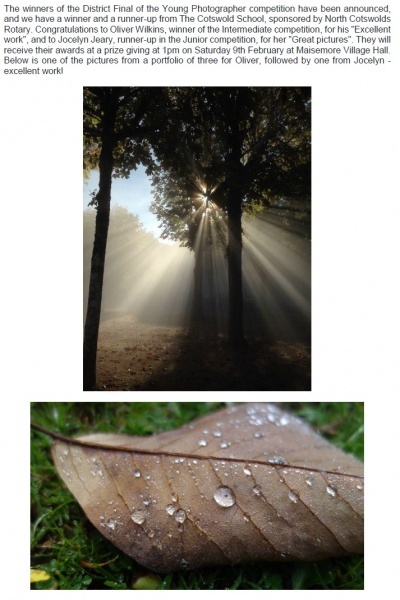 (Photographs are taken with North Cotswolds Club Member Mike Boyes presenting them with certificates & pens). 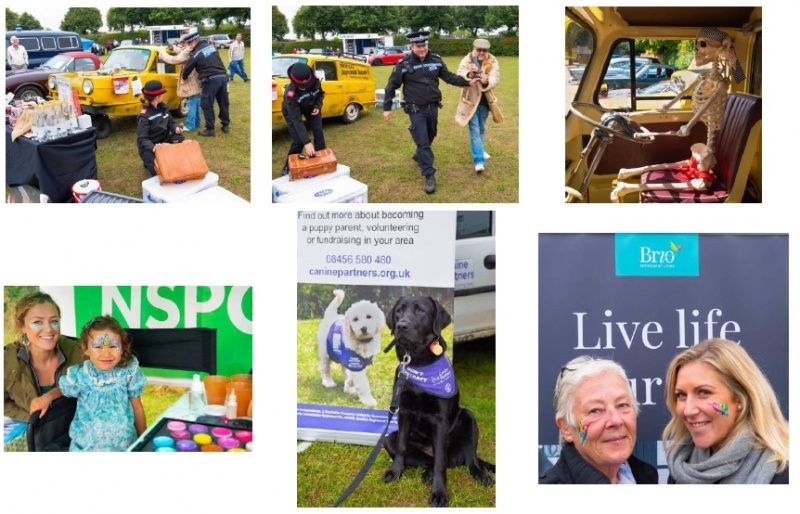 This anniversary was an opportunity for us to celebrate our involvement in lots of projects and activities in our local community, including organising youth competitions to encourage young talent, blood pressure testing days, Christmas lunches for the elderly and those with disabilities, and various environmental improvements. We have also responded, with generous help from the public, to international disasters and have recently raised over Â£5,000 for earthquake victims in Nepal. 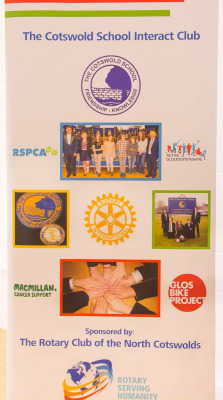 For our 2015 / 2016 Rotary Year our objective is to forge strong mutually beneficial links with local businesses and organisations, so that together we can be of greater benefit to each other and our community. 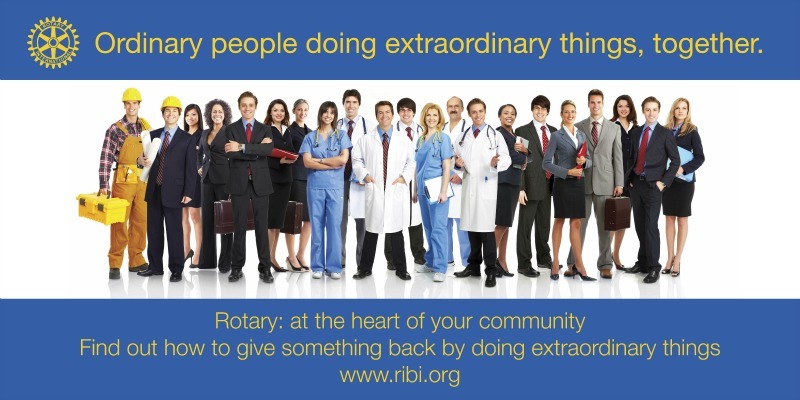 Being part of Rotary is more than just giving back to the community by volunteering it is also about bringing individuls personal skills, expertise and enthusiasm to help it thrive - whilst making some great friends along the way. 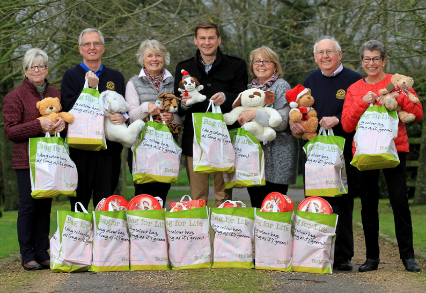 A local charity supported by North Cotswolds Rotary Club is currently organising Santa Sacks and fresh food boxes for families in crisis in the North Cotswolds this Christmas. Christmas is a difficult time for families where income is very limited, and with the assistance from organisations Rotary Community Awareness is able to help parents make Christmas a little bit special by providing toys, books, stationery, games and toiletries.